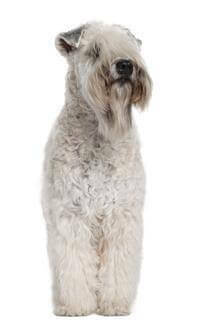 The Soft Coated Wheaten is an elegant long legged terrier, the ‘teddy-bear’ soft cuddly dog that is a delightful and faithful companion. It is a good family dog, orienting to the group rather than to one family member. It is generally good with children. It is happy and steady in temperament, carrying itself with an air of self-confidence. They are an alert dog that shows interest in the environment. They are less aggressive than is encouraged in some of the other terrier breeds. Since the Soft Coated Wheaten Terrier is good with children it is an ideal family pet. They love to be with people and are a loyal companion.